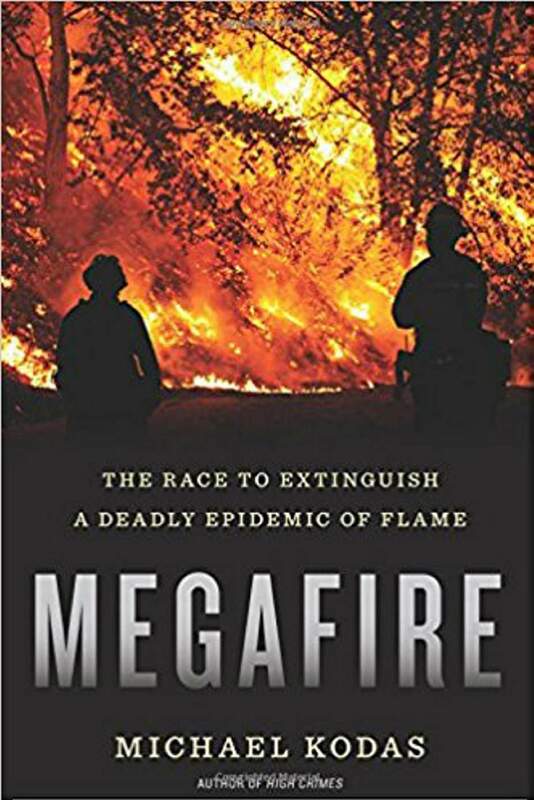 Megafire, by Michael Kodas, could not be a more timely, well-researched book written about this huge threat by Mother Nature to those of us living in the western United States. This part of the country does not have to worry about earthquakes, tsunamis, tornadoes and hurricanes. But Ma Nature with plenty of help from us bipeds and, the results of our thoughtless actions over decades, can take us out with fire. Wildfires are the West’s Katrina, Irma and Harvey. Recent articles about wildfires (Sept. 11, 15) appeared in this very publication. One questioned how the West got to its present situation and the other revealed that this fire season set a new record for money spent on fighting blazes. A staggering $2 billion! And the season is not over and could stretch into November. Fires are starting earlier and lasting longer. Hard-hit Montana might not get relief until the snow flies and smothers its ongoing infernos. Kodas, an award-winning journalist and the associate director of the Center for Environmental Journalism at University of Colorado, has traveled far and wide and spent years researching the disasters and the people who fight them to make sense of the overwhelming threat facing the West. Adding to the threat to humans is the way wildfires are fought. There are multiple agencies charged with this battle to save homes and lives. A chief concern and continuous problem is communication. Agencies have different ways of transmitting information. They use different devices or dispatch messages on separate channels, often with deadly results. This is seen over and over and one extreme illustration of this problem was present at the Yarnell Hill Fire near Prescott, Arizona, where 19 highly trained and experienced firefighters lost their lives. The author uses the Yarnell Hill Fire and its aftermath to bring home the complexities of what faces the West today. The division of responsibilities of different agencies is complex, and sometimes conflicts occur. Miscommunication was key in many areas where lives were lost. The Yarnell Hill Fire and the Granite Mountain Hotshots are critically important to the way wildfires are fought because that small fire resulted in the greatest loss of life of wildland firefighters in U.S. history. Kodas has studied the science, read reports and pored over legal transcripts and documents to gather the facts and put them into a clear and understandable narrative. He also had to draw on his emotional fortitude to interview those who barely survived the fires, and others who lost all their worldly possessions. Especially demanding were those conversations with those who lost loved ones. The methods used in fighting fires are also controversial. The use of air tankers is a great expense, and many times, conditions prevent them from being able to be aloft. Megafires, by many descriptors, defy control. Although the term can be debated, their behavior is not. These fires are fierce in intensity, display behaviors not previously observed and their duration is greater. Megafire is a compelling, educational and fascinating read. Where: Durango Public Library, 1900 East Third Ave.
Information: Visit http://bit.ly/2w9ngjT. All are welcome.